Scotland has a grand, deep tradition of storytelling. Around dinner tables and with bottles of wine and pints of beer, family, friends, and community members gather to tell stories and yarns, evoking memories and messages. Frightened Rabbit picks up on this tradition in the stories and threads of their songs and bring it forward with a folk-rock edge that’s undeniably emotional and intoxicating. Their music has an inflection and tone full of desperation and resolve that’s plainly unique and compelling. Refrains like, “Be less rude,” and, “Make tiny changes to Earth,” that weave their way into the music of Frightened Rabbit might sound trite without the earnestness of their delivery. But the sincerity is there throughout, and it rings in each turn. Imagine a high school love affair gone sour, with angst and melancholy, but with the hope of reconciling on a cold, rainy night in a coffee shop. Somewhere in that experience and imagery is Frightened Rabbit. The band has received accolades from many a rock critic. 2006’s Midnight Organ Fight, in particular, turned the ear of writers and promoters throughout the U.S. and the U.K. Its sound falls somewhere between that of Death Cab for Cutie and Arcade Fire, with a little Modest Mouse or Conor Oberst too. As of late, Frightened Rabbit has been playing a number of music festivals, and Hutchinson enjoys the festival experience. The energy of these huge events have become ubiquitous across the US and Europe, and they present challenges and benefits for Frightened Rabbit. 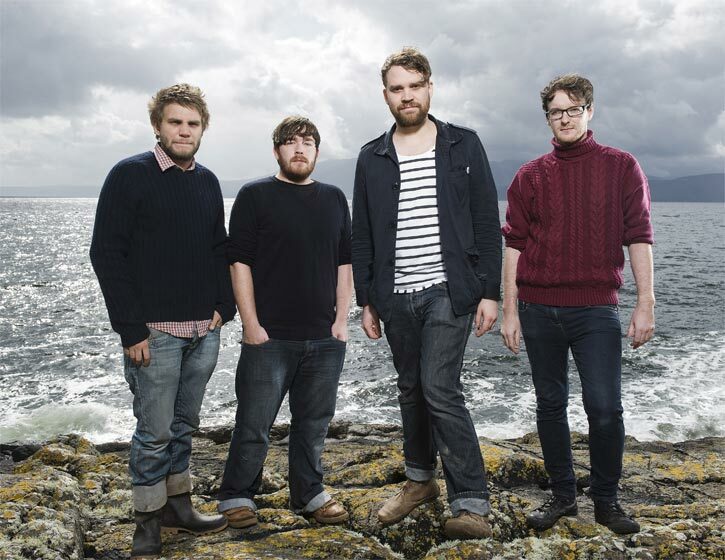 Recently, Frightened Rabbit announced that they’d be joining Gomez on an upcoming tour of the United Kingdom. “We’re big fans of Gomez, and we found out not too long ago that they’re fans of ours too,” beams Hutchinson. Sequestering himself in the home of a friend in Fife, on the East Coast of Scotland, Hutchison has been hard at work on new songs and a new album. A single is due out later this year and a full album will be out before SxSW next spring. The subject matter is going to depart from some of the heartbreak he’s written about previously. Storytelling out of the small hamlets of Scotland sounds almost too heavy for mainstream audiences, but it has clearly struck a chord with young music devotees. The tradition, the irony, and the cleverness carry forward. Listen to the song, “The Twist,” for example, on Midnight Organ Fight; the pop keyboards, the layers of vocals, and crescendos are right there, with the intense longing the lyrics describe. Songs like that capture the creativity and the honesty Hutchison says he wants to continue convey. And the tribes surely are ready to hear what Hutchison and Frightened Rabbit have to say next. David Orleans is a former REDEFINE magazine Staff Writer.